I recently got my hands on Suvir Saran's Indian Home Cooking at the local library. Saran's restaurants are all the rage in Manhattan right now, so my interest was piqued. Also, Cathy reported that she tried a recipe from this book and was happy with the results (it was her first foray into Indian food), so I felt encouraged to try some recipes too. The food in this book is luscious, with beautiful photographs and a pleasing layout. The recipes tend to be home-style North Indian, reflecting Saran's roots, and as a fan of regional cuisine, I love that. Today I wanted to bring dessert over to the home of some friends, and I decided to adapt Saran's recipe for no-cook Kulfi. Kulfi is Indian-style ice cream and the time-honored method of making it involves a great deal of sweating over a hot stove, as I have done to some extent before. This method takes all of 5 minutes from start to finish, plus a tiny bit of soaking time. Place the figs in a bowl with 1/2 cup milk or water. Microwave for a minute, then cover the bowl and let the figs soak for 10-15 minutes to soften and rehydrate. Chop the figs into small pieces. Mix together the evaporated milk, condensed milk, cream, half of the walnuts and half of the fig pieces. Process with immersion blender/ food processer/ regular blender for a few seconds. Add the cardamom and the rest of the walnut and fig pieces to the kulfi mixture and stir in. Pour the mixture into a container and freeze for several hours till solid. Lining the container with plastic wrap is an easy way to unmold the kulfi without a mess. Freeze in popsicle molds for individual servings. The verdict was unanimous: the kulfi is tasty and creamy, and just delicious. The taste of walnuts and figs is very deep since some of them are blended into the mixture, yet the chunky pieces add texture to every bite. This one is a keeper! Nupur this kulfi sounds delicious. Anything with cream and condensed milk has my vote. I am going to try it. I do have an electric ice-cream maker so I'm curious to see how will it come out by doing in the ice-cream maker instead of just freezing. Your presentation looks gorgeous, Nupur. 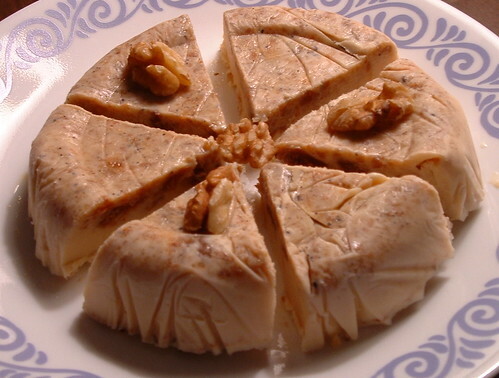 Walnuts and figs, what a novel idea for kulfi! that kulfi looks too good. Mine turns out to be too sweet for me. Am thinking the walnuts may help it to be not too sweet. am gonna try this one. That is sooo funny!!! I made Kulfi today too! Admitadly just a packet version *clare hides in shame* but I wanted to see what it would be like. I have made it properly before but that looks great! Easy too!!! Your serving style looks delicious. I love anything with figs and will try it soon. BTW, I have a 'to cook' list for so many of your recipes. Hi Ana, I predict that your ice cream maker will make this even creamier and more delicious!! Hi Bilbo, this was not cloyingly sweet but it definitely is not light on sugar either...and you are right, the slight bitterness of the walnuts is a great contrast to the sweetness. Hi Clare, I promise you this is much much easier than even the packet version :) What are kulfi ice blocks??? Not sure if I am posting in the right spot, but I made Chavli and it came out well. OK, I confess I don't strictly follow recipes, but this one is pretty similar to Araitha Vitta Sambar for South Indians..we also call it pitlai. Incidentally, I also have Suvir Saran's book from the library and after seeing your blog quickly decided to try something from it..I have not heard of Suvir before this.I made yellow mung beans with spinach and panchphoran ( I don't have 5-spice powder), but he gives alternate whole spices for tadka and it is really delicious and so simple...thank you, if I had not seen your blog, I would not have tried it. PS I am enjoying my new Preethi mixie from India, but not good for Idli batter..it heats up pretty fast..
glad the chavli was ok. And I am so glad you tried a recipe from Suvir's book. I have to try this dal too! and I tried the rajma and it was way too spicy even for my taste, not that great a recipe. This looks great. Suvir Saran's book is one of my very favorites, but I have not tried this recipe yet. I now plan to. I am especially crazy about his okra and cauliflower recipes. I have taken to giving this book for gifts.I hope that the recipients will cook from it when I come for supper ! I find that all the recipes I've tried work well, and that none require an excessive amount of work for the results. I'm going to get the ingredients for this one next week. Hi lindy, I would totally recommend this recipe...in the bok it's called "my nani's quick and easy kulfi"...so yummy. you know how it is, some recipes become instant "keepers" :) do let me know if you end up loving it as much as I did ! I will have to adapt your recipe for use in my kitchen. Nani would be truly proud of your addition of figs and walnuts. My partner and I spent several weeks in Kashmir last winter and have amazing dried figs we bought there. Nothing compares to their flavor, here. Very sad! I am looking into how we can get that to change and find them in our stores here. My grandma made Akhrot Ka Halwa, the recipe for which I hope to add into my next book. Not sure which one will have it. But I am sure you will like that too. Thanks for your blog, and thanks for trying this recipe from my book. Thanks for leaving a comment...it really made my day! I'm sure the kulfi would be excellent with your Kashmiri figs. I can't wait for your next book...Akhrot Halwa sounds amazing. I love the deep slightly bitter flavor of walnuts. Your recipes are really good, I am learning much from them. Nupur, you are too kind to me. My recipes are as much mine as they are yours. Certainly written with great assistance from Stephanie Lyness, who has worked really hard to assure everything I did in the kitchen found correct place in text. Nothing missing, nothing kept fugitive in detail. But other than that, I have played role of a carrier, taking them from panditji, our families chef and aunts, grand-aunts, neighbors, friends and people that were generous enough to share them. Thanks for sharing your own Kulfi experience. And yes, I love walnuts for the same reason. Tried your fig and walnut Kulfi, it was delicious. Thank u very much and I like all your recipes. Happy new year to u . My commenting on your blog has been long overdue.I have been using your recipes for sometime now and every time they are foolproof.To mention a few,the panipuri pani recipe cannot get better or simpler!It's fantastic.It has got my 6yr old hooked.She requests it everyday.I do however tweak it a bit by adding couple of tsps of apple butter for her.For us its perfect. The egg rassa,ragda pattice,amti are all excellent. I had to let you know I tried your fig and walnut icecream replacing figs with dates and my daughter had this to say,"Mom if i could rate this on a scale of 1 to 10 I'd give it 500 stars!" Those were her exact words. Anyway have to say a big thank you for all the wonderful work. can i try this kulfi with fresh figs?if yes any idea how many i can use? Vini- I have no idea. You'd have to experiment for yourself, I'm afraid.